Hitting Andrews Air Force Base for a round of golf, President Obama and Bill Clinton this afternoon are revisiting the pastime that forged their political relationship. The two are joined by U.S. Trade Representative Ron Kirk and Virginia gubernatorial candidate Terry McAuliffe, according to the White House pool report. 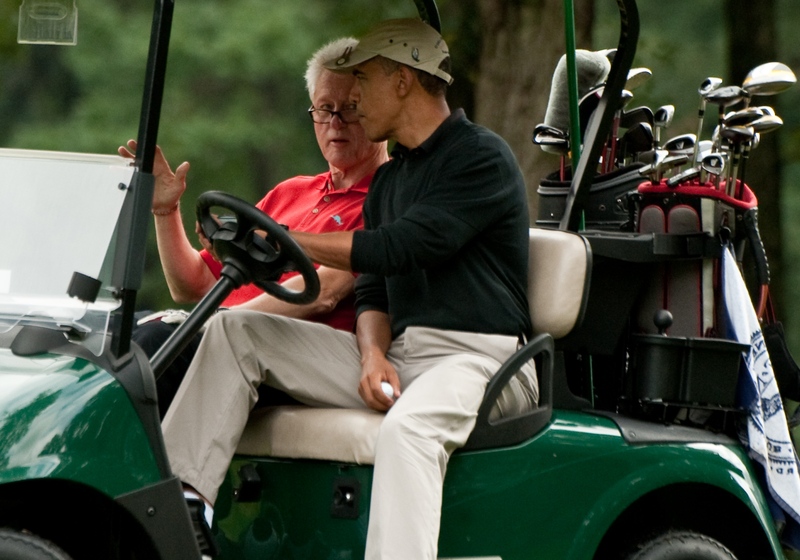 It's the third golf outing for Mr. Obama since winning re-election, and his second ever with the former president. Clinton associates have said when he received an invitation from the president to join him for a round Sept. 24, 2011, they took it as the first sign Mr. Obama was getting serious about his second bid for the White House and wanted Mr. Clinton's fabled retail campaigning skills on his side - "Why else would he spend hours on a golf course being lectured by Clinton?" the New Yorker summarized. Obama: "Fiscal cliff" would be "a Scrooge Christmas"
Are Obama's choices for state, defense imminent? The president got his wish, on all ends: the golf game, a hardy presence from Mr. Clinton on the trail, and, ultimately, re-election. As the seal to their newfound partnership - and end to a notoriously acrimonious relationship rooted in Mr. Obama's successful challenge against Hillary Clinton in 2008 - at the Democratic National Convention in Charlotte, N.C., the president awarded Mr. Clinton a prime speaking slot normally reserved for the vice president. Now, they're back on the links, and Mr. Clinton may be hoping for a better result than last year's outing produced. In an interview with Golf Digest, he called his 2011 performance against President Obama "really horrible." "On a normal day, just because I've played so much more - I've played decades longer than he has - I should probably still be a couple of strokes better," he said. "But he beat me fair and square." While some critics of Mr. Obama have gone after his prolific golfing excursions, Mr. Clinton suggested he needs to play even more: "For a guy who never really played seriously before he came out here, you can tell he's athletic," he said. "And he has very good directional control over the ball. He just needs to play more."